UC Libraries invites faculty and researchers to submit their research, creative and scholarly works to Scholar@UC, the university’s cutting-edge digital repository. A digital repository makes accessible, enables re-use, stores, organizes and preserves the full range of an institution’s intellectual output, including all formats of scholarly, historical and research materials. Faculty and researchers can use Scholar@UC to collect their work in one location and create an Internet-enabled, durable and citable record of their papers, presentations, publications, data sets or other scholarly creations. With sponsorship from a faculty member, undergraduate and graduate students may also contribute their academic output, such as capstone projects, senior design projects, research data and other creative and scholarly works. To self-submit to Scholar@UC, faculty and researchers should visit https://scholar.uc.edu/ and select “Log In.” A UC central login username and password is used to sign into Scholar@UC. Once logged in, the user can select “Add New” from the menu to begin self-submitting work. Assistance in the form of FAQ’s, copyright information and a contact link are available. For additional help, submitters can email scholar@uc.edu. Scholar@UC is not ‘finished’ or ‘done’ as it will continue to evolve and improve. Recently, a small group of UC faculty members used Scholar@UC to self-submit their scholarly output such as white papers, analyses, data sets, publications, presentations, instructional materials and more. The feedback from these early adopters helped refine the functionality and future development of Scholar@UC. The on-going development of Scholar@UC will be driven by user feedback, and users are encouraged to email scholar@uc.edu with suggestions and questions. For more information about Scholar@UC, contact scholar@uc.edu or visit https://scholar.uc.edu/. 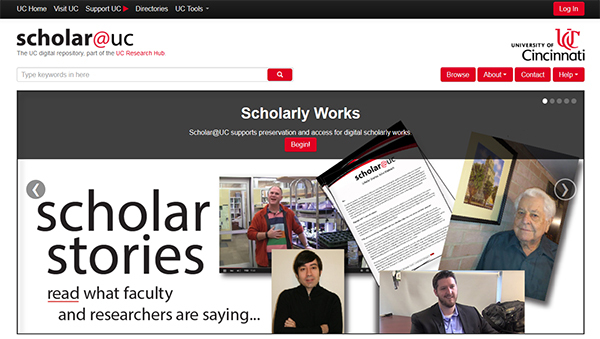 For announcements about new software functionality and changes, as well as stories about the Scholar@UC early adopters (“Scholar Stories”), follow ScholarBlog at http://libapps.libraries.uc.edu/scholarblog/.